Enzo Maccarinelli aims to dispel recent problems when he fights Juergen Braehmer for the WBA light-heavyweight title in Rostock on Saturday. Former WBO cruiserweight champ Maccarinelli admits he should have taken a break from the ring during a difficult period in his personal life. "I had a few problems over a couple of years - my head was just in a bad place," said the 33-year-old Welshman. "I was carrying on boxing when I shouldn't have." The Swansea boxer suffered five stoppage defeats in 12 bouts between March 2008 and September 2012. 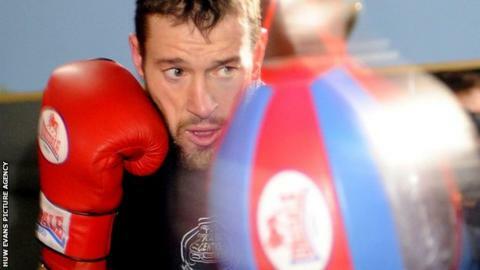 It was a run that led many observers to call for Maccarinelli to hang up his gloves. He also served a six-month sporting ban after testing positive for a banned substance. However, a run of three wins, including a revenge stoppage of Ovill McKenzie to win the Commonwealth light-heavyweight title, has resulted in the unexpected chance against Braehmer. The 35-year-old Braehmer, who has 42 wins from 44 professional fights, is the WBA's 'regular' champion, meaning he is not a world champion in the strictest sense. Kazakhstan's Beibut Shumenov, the WBA's 'super' light-heavyweight champion, fights IBF title-holder Bernard Hopkins on 19 April. Whatever is at stake in Germany, Maccarinelli admitted it seemed an unlikely prospect after a second-round stoppage by McKenzie in 2012. "I lost my dad, my son was diagnosed as autistic and I failed that drug test," said Maccarinelli. "My wife told me not to box, take a year out, but I didn't. "Stylistically, Braehmer is probably the worst one I could have picked. But I can quite honestly tell you I've never in my life turned a fight down."